My 12 year old put these together as teacher appreciation gifts, but they could just as easily be an end-of-the-year gift. We went to Starbucks to buy gift cards and for some clear frappuccino cups, domed lids and straws. They were more than happy to help us out, especially when we told them what they were being used for! At first my daughter wanted to fill the cups with brown or kraft-colored tissue paper, but those proved difficult to find. Instead, she used kraft packing paper which we had plenty of. 1. 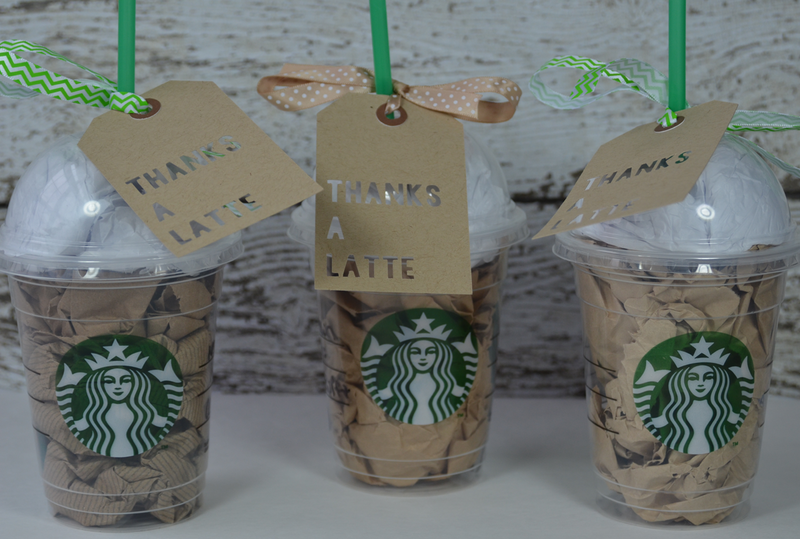 Place a gift card along the inside edge of the cup. 2. Stuff a piece of the kraft paper into the cup, large enough so it reaches the top edge of the cup. Use a pencil to poke a hole through the center of the paper for the straw to fit into. Add the straw. 3. Crumple two pieces of white tissue paper, form it around the straw, and place on top of the kraft paper. Cover the cup with the domed lid. 4. Use either pre-made shipping tags and write or print your own sentiment or you can use a Silhouette cut file to cut the tag and the sentiment of your choice in one step. 5. Tie the tags onto the straw with your ribbon of choice. An easy gift, but much appreciated. Be sure to check out the "Teacher Gift" tab on the home page of my blog for a list of other great teacher gift ideas. What a great idea and how adorable it turned out. What a great gift idea! I loveeeeeeeeee these!! Pinning!!! Wow, Lisa, what a super creative idea, love how they turned out!! What a cute idea! These turned out great! What a great job she did!! Super cute and so fun! What a fun idea! Love this! Stop!!! Too cute and so easy to quickly put together!!! tfs - These are fabulous! Love the sentiments! Adorable!!! I just LOVE these!!! She did a awesome job!! They look great!! Love love love this idea!! Came out so cute!